The “Ponte Vecchio” bridge (translated as “Old Bridge”) is the most famous bridge over the Arno River in Florence. It is one of the main tourist attractions in the city. The bridge is located in the city center, at a distance about 250 meters from the Signoria square and the Uffizi Gallery. Ponte Vecchio is the oldest bridge of the Florence city. For the first time the existence of the bridge on this place was mentioned in documents in year 996. The bridge was destroyed by a flood in 1117, then built again, and destroyed by the river again in 1333. The current bridge was built in 1345. The bridge width is about 32 meters; the spans are about 30 meters long. Main feature of the bridge are located on the bridge shops. Initially there were shops selling a meat. Jewelry shops and workshops are located on the bridge since the XVI century. (So, sometimes bridge was called "Golden Bridge".) Jewelry and souvenirs are selling here in our time. Perhaps this bridge has left its mark in the history of mankind. It is supposed that the economic term "bankruptcy" appeared here, on this bridge. In medieval times, if a merchant could not pay his debts, the table on which he sold his goods ("banco") was destroyed by soldiers ("Rotto"), and it was called "bancorotto" (broken table). With no more a table, a merchant was not able to sell anything. 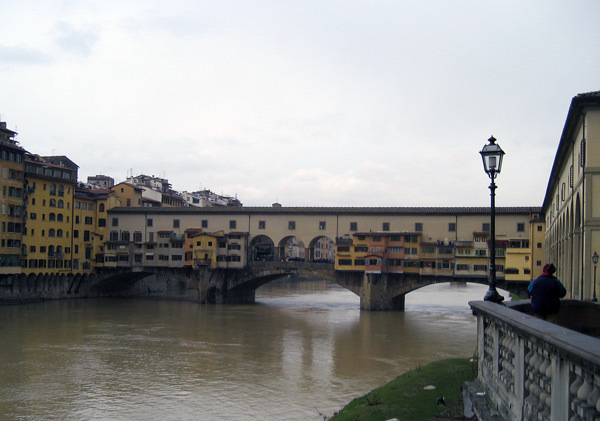 The bridge “Ponte Vecchio” was visited by Hitler in 1938. It is the only bridge in Florence that was not destroyed by the Germans army in August 1944. The distance from the “Ponte Vecchio” bridge to "Piazza della Signoria" square is about 250 meters, to the "Santa Maria del Fiore" cathedral about 500 meters, to the railway station about 1 kilometer.